The Turbo FT™ is a patented, rotary scan interferometer which can achieve scan rates of 25-100 spectra per second. Its small size, ruggedness, speed, and very low power requirements make it an ideal candidate for high vibration environments both in the lab and out in the field. The Turbo FT™ has been used in an airborne application for geophysical remote sensing of IR spectra of the ground. Its high speed of 100 scans per second makes it insensitive to vibration and allows excellent ground resolution of spectra. 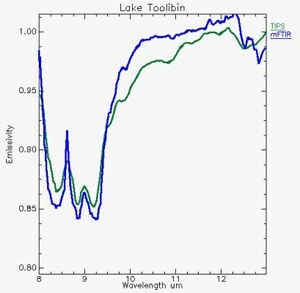 The figure at the left shows some results obtained by this instrument at Lake Toolibin in Western Australia. The plot shows absolute emissivity spectra of kaolinite, one from the TIPS (Thermal Infrared Profiling Spectrometer) airborne instrument, the other from our Model 101 mFTIR ground truth spectrometer, which was used to verify the aircraft data. The Model 101 (and current Model 102) use our Micro FT™ interferometer, plus our temperature controlled blackbodies and other accessories, to collect the field data required for calibrated measurements of absolute emissivity.